Monitor pollen counts in your area. There are multiple ways you can find out the pollen count, from online sites to your local newspaper. If very high levels of pollen are expected, try to minimize the time you spend outside. Hot, windy days are often bad pollen days. On the other hand, pollen counts are often lower right after it rains. Pollen counts usually are higher in the morning, so schedule your outdoor time for the afternoon or evening. Keep the windows of your car rolled up when you are driving. Get someone else to mow the lawn. If you must mow, wear an allergen-reducing mask and safety glasses or sunglasses; pollen also can enter your body through your eyes. If you have been outside for long, especially if you have been working in the yard, take off your clothes and wash them as soon as you come inside. Keep your windows closed; run your air conditioning if it is too warm. Vacuum regularly, using a vacuum with a double bag or a HEPA filter. Don’t dry clothes, especially sheets and pillowcases, on a line outdoors. Instead, use a washer and dryer. Remove carpet and drapes, which can trap and hold pollen. 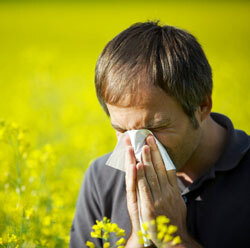 Hardwood or tile floors and shutters and blinds are much better for allergy sufferers. Take your shoes off right away when you come inside. If you must keep your shoes on, wipe them thoroughly on a mat or rug so that you don’t track pollen throughout your house.